To be able to take a deep breath in your own home that you know is safe, pure, clean, and healthy is an assurance that you can’t pass up. At UltimateAir we have a product that will allow you to finally be able to trust the oxygen and air particles going in your body. The RecoupAerator, a top-of-the-line air filtration system, does all that and more! This ERV system recovers 95% of would-be lost energy as well as the filtration of air particles as small as 3.5 microns. 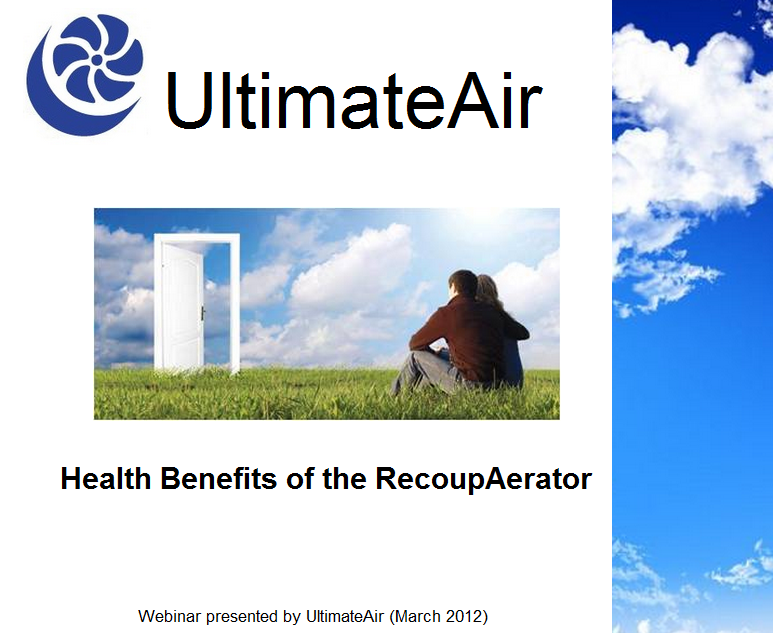 This month at UltimateAir we have created a webinar that will help you learn more about the RecoupAerator, your health and the many reasons why this product is for you. Each month we will come out with new and interesting topics that will relate to your life including tips for air safety, indoor air pollution, ways to improve your living, and green energy. Make sure you visit our website at www.ultimateair.com/library/webinars/ to stay tuned for more of our webinars including our latest webinar on your health and ways to improve your health through your indoor air ventilation.